For a fast-paced 92-minute documentary, The Cove, is many things at once—action, adventure, activism, marine biology and biography. Winner of this year’s Academy Award for a feature length documentary, veteran National Geographic director Louie Psihoyos brings together marine mammal specialist Ric O’Barry and a cast of extreme athletes, adrenaline junkies, event and special effects experts. Together they expose Japan’s horrific dolphin sales and slaughter while educating the viewer on both whaling law and why we might regard dolphins as sentient beings. 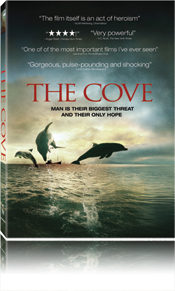 The Cove’s activist message is vital and makes this an important film to see. Add to this tremendous irony and suspense as the story unfolds, and you have a first-rate human drama. In a ‘life is stranger than fiction’ twist, O’Barry is the trainer who introduced the public to dolphin’s when he selected and trained the dolphin stars of the hit Sixties television series, Flipper. O’Barry has spent the last 35 years, by his own account, trying to undo the demand for, and perceived acceptability of dolphins as caged creatures for human entertainment, or more darkly, in our diet. See this film. Now available at NetFlix or your favorite DVD rental outlet.